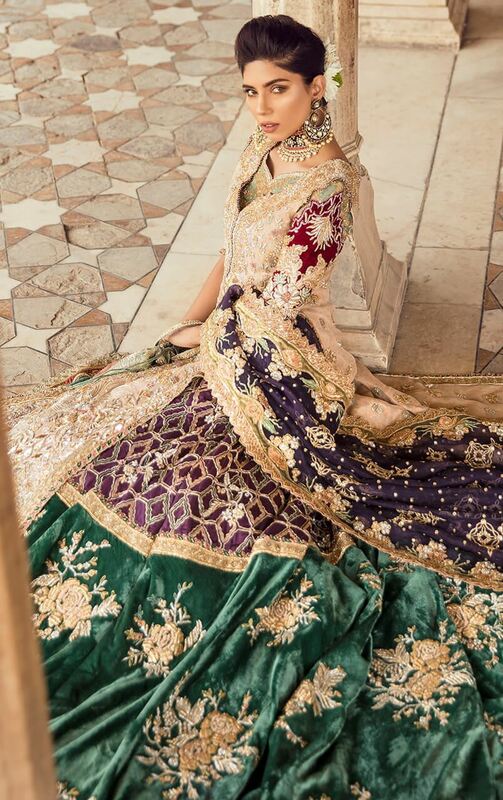 Rara Avis, meaning ‘rare bird’ is what Tena Durrani’s bridal couture collection 2019 is called. The one of a kind collection is a collage of vibrant colors and the best of eastern fashion moments. Each piece is quite one of a kind and comes together in its own unique design and patterns. The designer pulled off the pure traditional collection and gave it a modern and confident twist with edgy color combinations, cuts, and embellishments. The details are subtle yet defined to perfection. The dupattas are all done with a spread of embroidery and heavily embellished borders, all reminiscent of the golden era of eastern hand-embroidered masterpieces. ‘Rara Avis’, is an artisanal achievement of avant-garde masterpieces made with traditional craft. 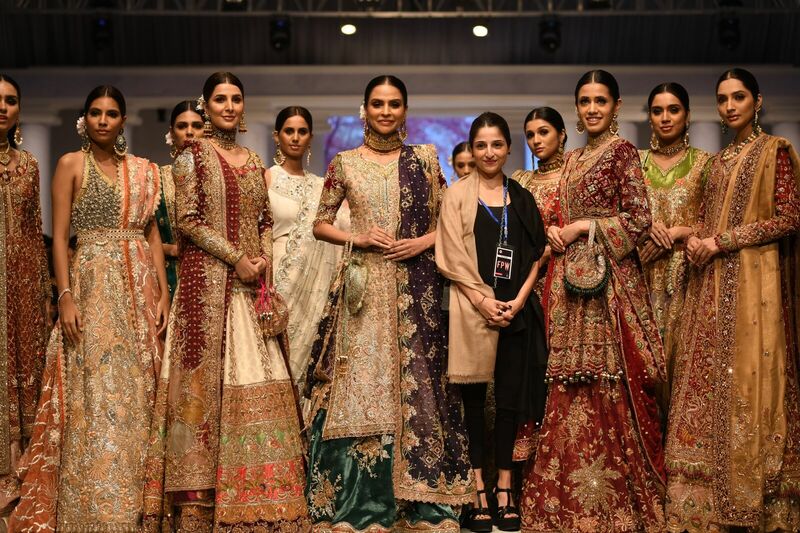 Tena showcased her collection at ‘Rara Avis’ at FPW (Fashion Pakistan Week) near the end of 2018. Her silhouettes though, traditional yet are crafted with a masterful skill that’s a tribute to strong- spirited, undefeated women everywhere. With her usual sublime and flamboyant designs, exotic shades and luxe fabrics, Tena Durrani continues to stun the audiences yet again. 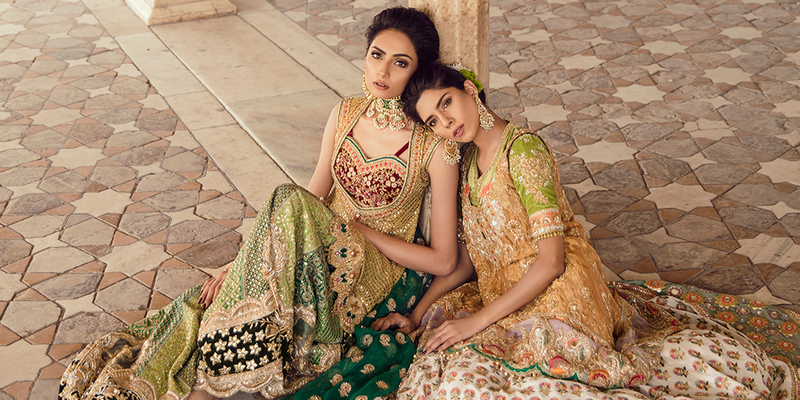 Timeless and regal; the traditional red and gold combinations of this collection are vivid and bold in their impact that will make look any bride like royalty. 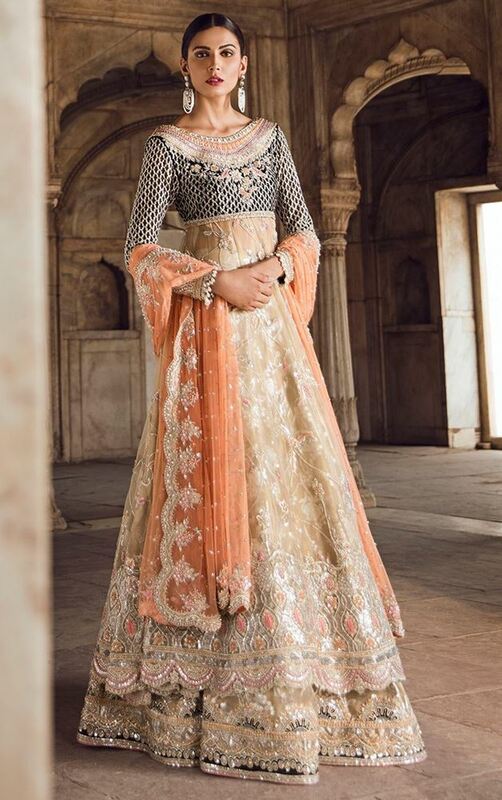 You will find that in Rara Avis Tena offered more than one tops for the lehengas so you can decide if you are comfortable with heavy pairings or you’d like to cut the embroidery a little. With fabrics like organza, meysuri and brocade; she chose to embroider the beautiful articles with dabka, nakshi , resham, and crystals. You can witness the results for yourself to be as perfectly amazing, as you’d hope for a bridal dress to be. Green is a great and a forgiving color with flattering hues that work for everyone. It also exudes confidence, and we’d be lying if we didn’t say that these green bridal dresses didn’t make us fall in love. Also, think of all the fun accessories you can pair with these green ensembles. 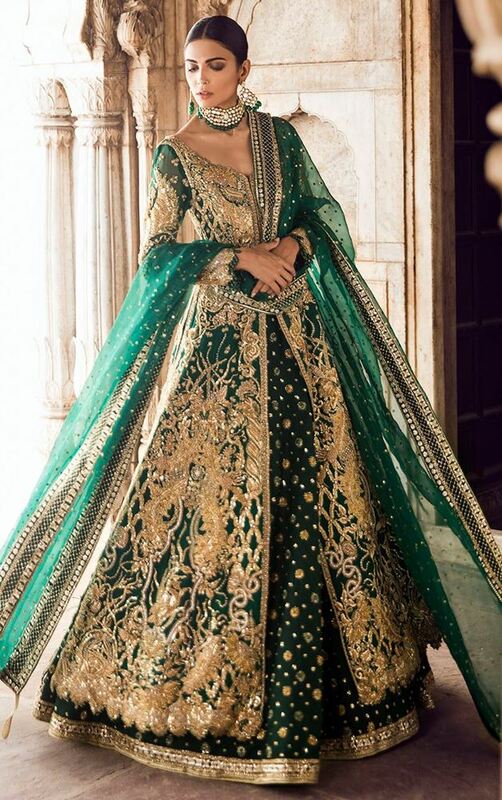 Given the gota booti work, the outfits look beautifully traditional. The green dupattas with booti chan all over and embellished borders on all four sides is reminiscent of old Punjabi weddings. If you are looking to break the convention as a bride, what could be better than these unique bridal pieces? The pink, peach, orange, lime, and yellow hues will be refreshing for a spring/summer wedding, don’t you think? 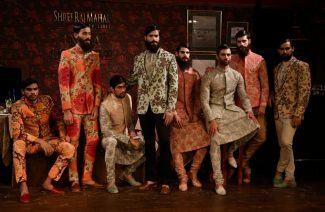 You can pull these outfits for any function from Mehendi to reception and your outfits of choice will look absolutely original. Don’t know about you, but we totally are crushing over the bold choices with intricate details. The stitching and cuts can be customized to suit your preferences. Hopefully, now you are getting why we call this collection one of its kind, right? The neutral tones used in this collection are available for both reserved modern and traditional brides. So ladies, you can pick your avatar for the big day. You can go either monotonous with this first outfit. Adorned with bead stone finishing on sleeves and neckline. Resham ball finishing on shirt hem, this outfit is princess perfect. 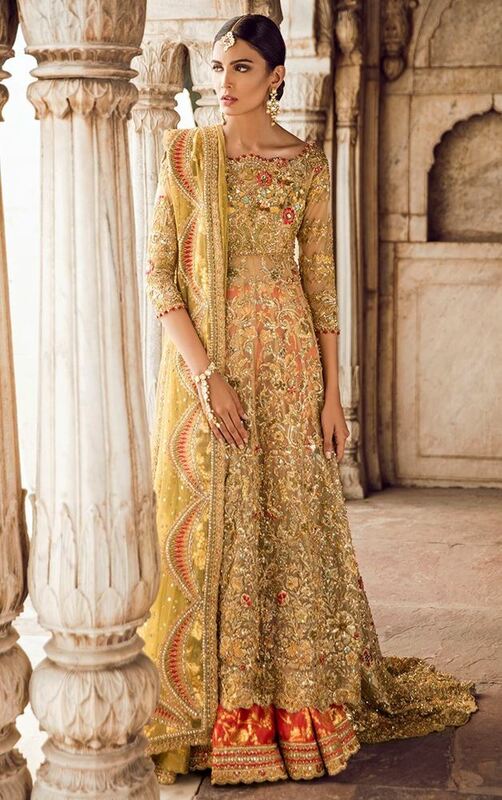 If you are looking for something but a bit more color, you can choose this Farshi lehnga; color blocked with apple green brocade at the top and peach katan silk at the bottom, embellished with floral bootis, and magenta velvet embellished borders. This outfit is traditional, without being over the top. The color fusion lehengas are something very inspiring to behold, which makes them the choice of the trendsetter brides. These too come with dozens of accessory options. These both attires complement off white with shades of green, and the effect is pretty great. They are both heavily embellished but their neutral shades keep them from being too overwhelming. So which of the Rara Avis caught your eye? The collection already made headlines at the Fashion Pakistan Week Winter Festive ’18’s first day.